View from River Oaks Park in the early spring, looking upstream on the Mississippi River. River Oaks Park, a 2.1-acre parcel on the bluffs of the Mississippi River in Cottage Grove, is currently undergoing an ecological restoration. The city of Cottage Grove is partnering with FMR to restore the native plant communities on the property including a rare remnant bedrock bluff prairie. The topography is mostly quite flat, at the north end and middle, but gets gradually steeper at the south end, and drops off precipitously at the cliffs near the south edge of the bluff. During the mid-1800s, the site was a combination of oak savanna and bedrock bluff prairie. Today, the area has filled in with woody plants, primarily buckthorn. 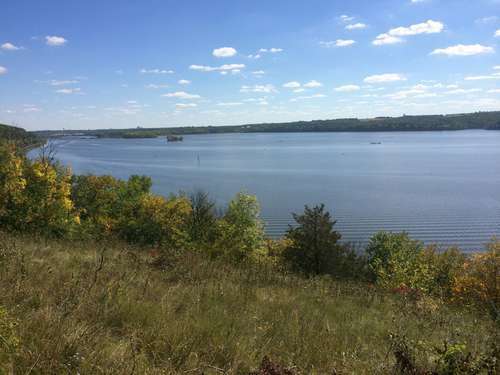 FMR wrote a natural resource management plan for the site in 2012 and then obtained funding for restoration activities from Legislative-Citizen Commission on Minnesota Resources and the city of Cottage Grove in 2013-14. Work commenced in September and the first task was to remove exotic brush from the site. On September 27th, FMR hosted a volunteer event in which buckthorn was hauled from the bluff prairie. 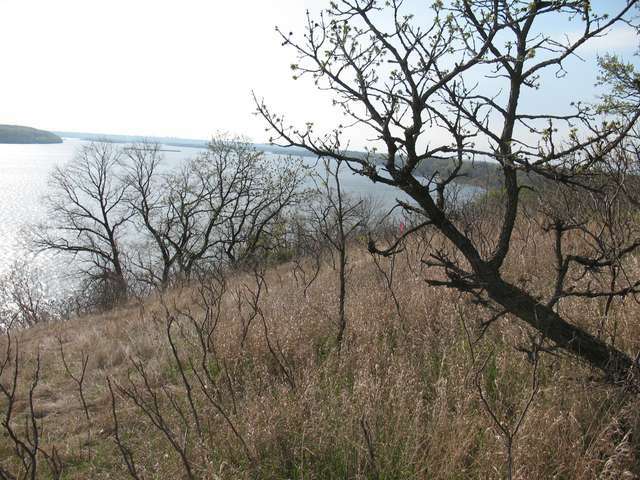 The remaining tasks slated for the site include removing the rest of the buckthorn, restoring oak savanna and oak woodland, and enhancing the bluff prairie itself. Activities are scheduled through June of 2016. View from River Oaks Park in late summer, looking downstream the Mississippi River. Note the Hastings Bridge in the distance. The bluff prairie is a beautiful little remnant of a larger prairie that occurred here historically. At one time, prairie was a fairly common plant community all along the river bluffs, but today it is increasingly scarce and fragmented. This remnant was identified by the DNR in 1987 as having high biodiversity. Due to suppression of wildfire and the introduction of exotic invasive species, the prairie is being encroached upon and invaded by woody vegetation (primarily buckthorn, Tartarian honeysuckle, and sumac), which will now be removed. Also, burning the prairie is a high priority. 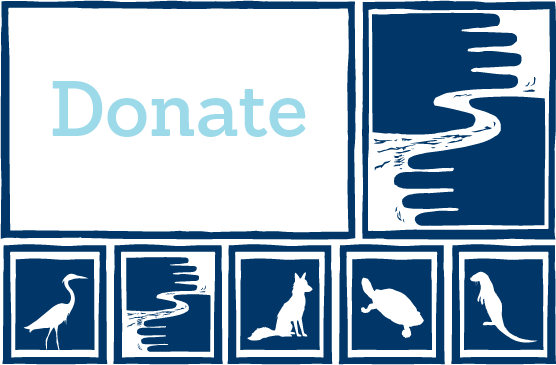 A major goal is to engage the adjacent landowners, who own parts of the remaining bluff prairie, to partner with us in managing the entire prairie collectively. Some of the interesting plants that you can find in the bluff prairie remnant at River Oaks Park are: little bluestem, Muhly grass, big bluestem, indiangrass, harebells, butterfly milkweed, prairie violet, rough blazing star, leadplant, silky aster, yellow sundrops, false foxglove, and American bittersweet. The steep sideslopes, south of the bluff prairie, are fairly densely wooded, and contain numerous, large pieces of exposed bedrock. After exotic woody brush is cleared from these slopes, the woodlands will be much more open, and the bedrock will be much more prominent, adding interest to the site. Though you wont find them today, a site like this would have been prime timber rattlesnake habitat in the past. Probably the most striking thing about this park is its spectacular views of the river and of the landscape beyond. Standing atop this bluff, you can see for miles, with an impressive 180-degree field of vision (the Hastings bridge, downstream, for instance, can easily be seen). On a sunny day, the river seems to sparkle, as if the surface were covered with hundreds of diamonds. Thanks to the bluff prairie we are afforded this view, since trees would otherwise obscure it.